What if you could extend a floor to cover your pool? How safe would your pool be if it was “underground” while not in use? 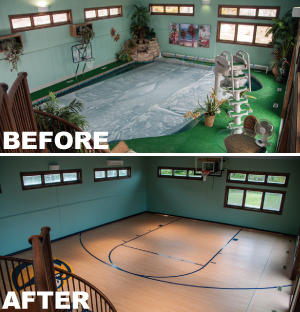 What if you could convert your backyard pool to a basketball court? The WutPool cover offers the ability to “hide” your swimming pool underground. Custom steel or aluminum panels are manufactured to conceal your pool by sliding over it with the simple push of a button. This unique ability is brought to you exclusively by the WutPool retractable pool cover system. 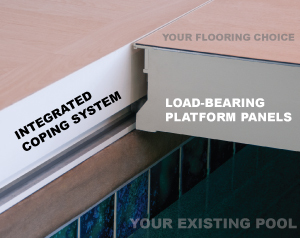 The load-bearing platform panels are strong enough to drive a car on, and lock seamlessly to ensure a securely closed pool. Indoor pool rooms provide a single function. The WutPool retractable cover system allows you to convert your indoor pool room into a space you can use for just about anything. 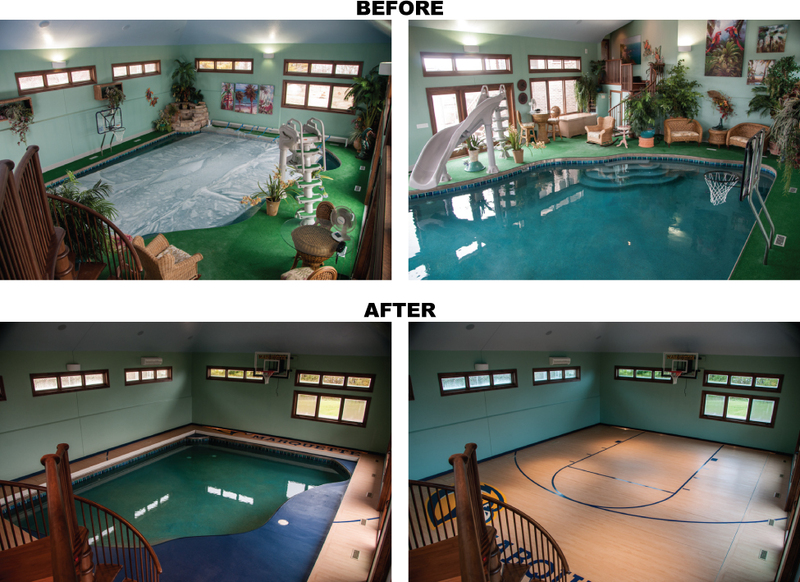 You can essentially hide your pool under the floor in just a few minutes. Convert your pool room into a large family room to watch movies, have an indoor basketball court, or gain extra safety and peace of mine while you leave your kids home on your next vacation. All it takes is the turn of a key, and your pool disappears automatically in just a few minutes. Our team of engineers will install automated robotic systems that gently and quietly slide load-bearing platform panels along a patented, integrated coping system. When your pool is open, the panels are hidden in your wall or underground (we will customize the system to your facility). They are neatly stacked in a manner that maximizes efficiency in space usage. The flooring on the retractable pool cover panels can be customized to match your facility’s existing floor. We offer a wide selection of flooring options. Learn more about how it works or view case studies. Contact us to learn more about how we are implementing hiding pools in homes, hotels and pool facilities with the WutPool cover. Converts any space (or pool) into a solid floor. Floor/Pool disappears with the push of a button. Opens and closes in minutes. Our patented roller track system allows custom-manufactured, heavy-duty, load-bearing panels to move easily above your pool and lock firmly into place. Learn more on our How It Works page. Athletic courts, ice rinks, event venues, sports fields and more... Our products may be applied far beyond pool covers. If you have a need for a conversion using a load-bearing, retractable floor, we can probably design a solution for you. Learn about our additional application opportunities on our Applications page. Learn more on our Case Studies page.